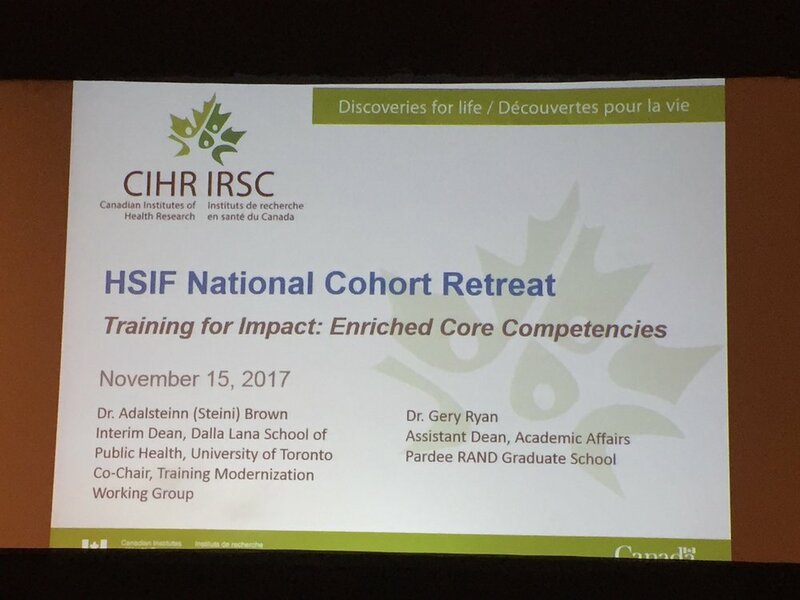 This week Dr. Salah Uddin Khan, Dr. Victoria Ng (Public Health Agency of Canada), and I had the great pleasure of attending the first CIHR Health Systems Impact Fellows Cohort Retreat in Toronto. Salah was awarded this prestigious postdoctoral award in the summer and began his fellowship in collaboration with the National Microbiology Laboratory this fall. The goal of these fellowships is to train PhD graduates in a way that focuses on both research and core competencies (such as project management, leadership, and change management) so that they can progress in their careers as leaders within the Canadian Health System. This was the first cohort retreat and it was a really excellent experience for both the fellows and their academic and organizational sponsors. I met many really interesting fellows who I expect will go on to do great things for the Canadian Healthcare system. One of the really amazing things about the inaugural HSI cohort? 80% of the fellows are women! I am looking forward to the next retreat in spring 2018. Do you aspire to be a "future veterinarian?" We are currently recruiting undergraduate students interested in helping out with a large equine research project that will be running from November until the Christmas break 2017. No horse experience is necessary. This is a great opportunity for students interested in a career in veterinary medicine to learn more about veterinary research and get some experience working in a large animal (equine) environment. You will be providing technical and logistical support to the study coordinator, Dr. Tanya Rossi. Please contact Dr. Amy Greer in the Department of Population Medicine to learn more about this opportunity.